This little doo-hicky is called the Dynamic Volume Chamber, and it comes from a small Australian-based company called SD Components. 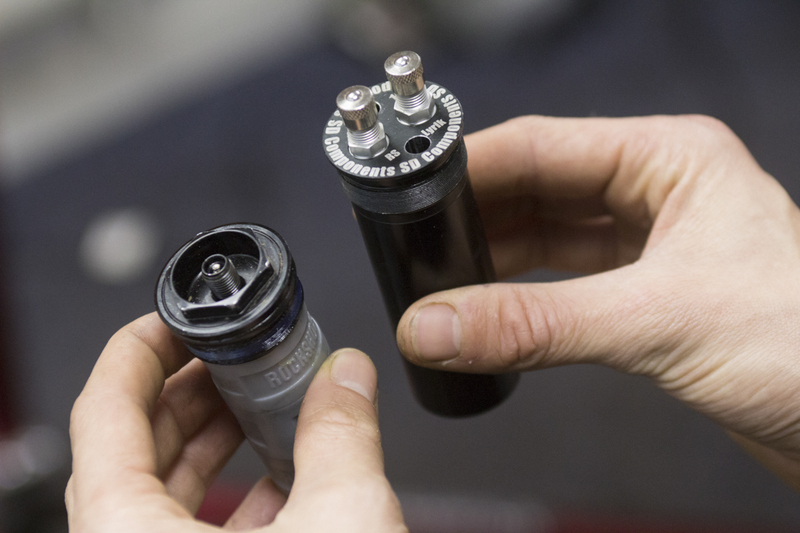 It’s a sealed air chamber that replaces the standard top cap and Bottomless Token system in your RockShox Pike, Yari, Lyrik or Boxxer fork (there’s also a newly released version for Fox 36 forks too). 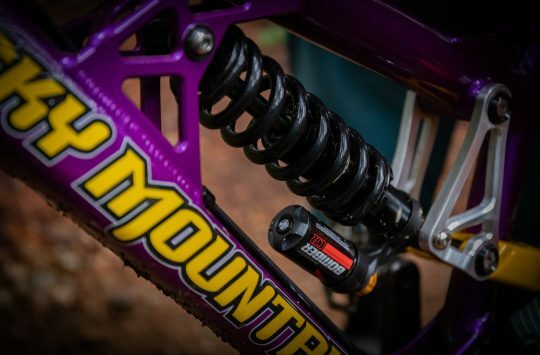 Like the MRP Ramp Control cartridge, the DVC is designed to offer the rider extra adjustability over their fork’s air spring behaviour. How each design achieves that goal is very different though. Whereas the MRP unit alters spring behaviour by manipulating the air flow rate through its adjustable valve, the DVC uses a pressurised chamber that can be adjusted using one of the two air valves on the top. The DVC essentially turns the fork into a triple air spring format, with two chambers for the positive spring, and one chamber for the negative spring. 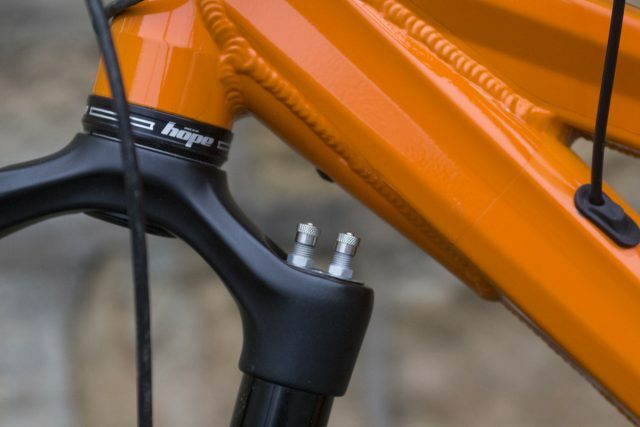 The DVC is designed to replace the standard top cap and Bottomless Tokens in your RockShox Lyrik/Pike/Yari/Boxxer fork. But is that extra adjustability actually necessary? The latest Pike and Lyrik forks are very, very good performers, and surely the engineers at RockShox have their own thoughts about people installing hop-up kits into the products they’ve spent years designing, testing, refining and agonising over? Needless to say, they probably won’t be honouring your fork warranty if you start plugging in aftermarket kits into their forks. The idea behind this funky looking gizmo is similar to using Bottomless Tokens in the fork. 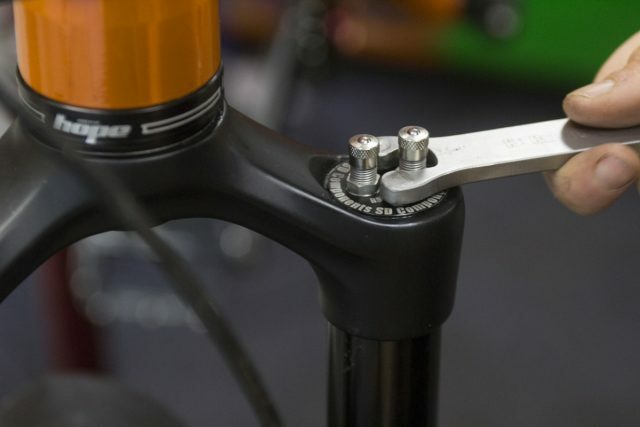 Adding tokens allows you to make your air spring smaller and therefore ‘ramps up’ the pressure inside the fork as it goes through its travel. A fork with no tokens will be more linear, and as you add tokens it gets more progressive. While there are many variables, in general heavier and more aggressive riders can benefit from running more tokens. 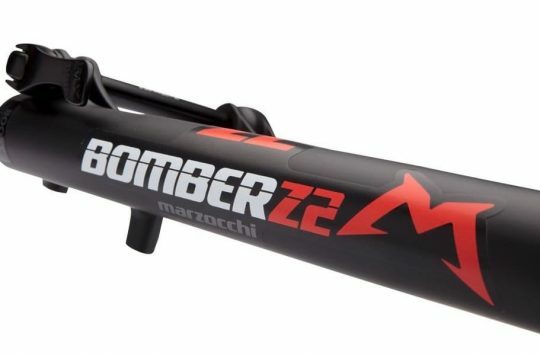 This allows you to run a lower initial air pressure in the fork for a more supple feel in the early part of the travel, but with sufficient bottom-out control. Sounds good. In search of this magical balance, I’ve been experimenting with Bottomless Tokens in my 170mm travel RockShox Lyrik fork a lot over the past nine months. I’ve tried running it with zero tokens, and with as many as five. Prior to testing the DVC, I’ve been running three tokens, which has allowed for a low initial pressure for small bump compliance and good support through the mid-stroke. However, I’ve still never actually bottomed out the fork. There I’ve said it – I never bottom out my fork! Despite carrying around 170mm of travel, I only ever get about 155mm out of it. I’ve tried less pressure, but it dives more. Fewer tokens – same thing. I figured I needed to try something new, so as you can imagine, I was pretty intrigued when a (broken) Ross dropped the DVC into my lap to test out. 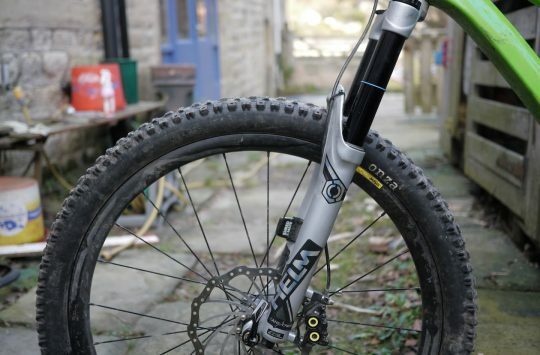 Andrew’s been running three tokens and 75psi inside his 170mm travel RockShox Lyrik fork. First though, I wanted to check that my fork had a decent baseline setting. I borrowed the office ShockWiz and off I went for some measured testing. With three tokens in the fork as usual, I set up the ShockWiz accordingly. That meant letting all the air out, then measuring the compression ratio by marking full extension, and full compression of the fork. Once that was set, I re-inflated the fork, and off we went. That aside, the ShockWiz confirmed my fork was setup correctly. All the lights were green on the app’s recommendations, and everything seemed to be working well. However, I still wasn’t getting full travel. Nothing new there though. The DVC comes with a custom tool that helps you to remove the stock top cap. The DVC comes supplied with a custom tool, which is a beautifully made pin spanner that’s used for installing the DVC via two corresponding holes in the top of the chamber. 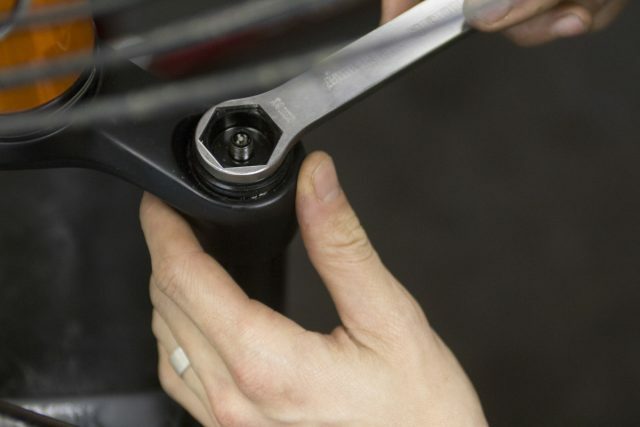 To remove your existing top cap, depressurise the air chamber, and use the opposite end of the pin spanner to lock onto the top cap and unwind anti-clockwise. From there, the DVC simply threads in and is tightened up with the pin spanner. The steel tool uses two pins to lock into the DVC. Just the tool in itself is a beautiful piece of machining. Based on the setup advice listed on the SD Components website, I stuck with 75psi in the main air chamber (Valve 1), and went with 100psi in the DVC chamber (Valve 2). Of note here is that you’ll have to inflate the DVC first to 100psi, before inflating the main air chamber to 75psi second. On the first few rides, everything was feeling good, though to be honest, it wasn’t too dissimilar from the previous token-based setup I had been using. As in, I still wasn’t achieving full travel. Once I had this base setting though, now I could tune the end stroke better. I wanted that same feeling – suppleness to begin with and support through the middle – but with the ability to use all of my travel. Referring back to the claims made on the DVC website I thought I could use the dynamic nature of the DVC to help me. So I decreased the pressure in the DVC air chamber down from 100psi to 85psi. Because this affects the pressure inside the forks main air chamber, I then rechecked that and adjusted it back up to 75psi. The twin valves on the DVC do stick up quite a bit, which could be tight on some frames. On my first ride out with the changed pressure in the DVC, the fork felt downright amazing! I had exactly what I wanted, with a similar feeling in terms of small-bump compliance and mid-stroke support, but now I was now achieving full travel. It must have been the DVC opening up and having slightly less ramp at the end compared to using a solid set of tokens. It worked an absolute treat. The lower pressure in the DVC and its dynamic nature, opening up halfway through the travel, meant I could get everything out of the fork. The end result was that my Lyrik felt nice and supple for maintaining tyre contact on smaller rubble, while also feeling active on the bigger hits. At the end of the test, I had to remove the DVC to ship it back to Simon of SD Components in Australia. I re-fitted the stock top cap and Bottomless Token setup, and the difference was immediately noticeable on the first ride. Since then, I’ve been struggling to get the same ‘floaty’ feel that I had with the DVC. I’ve actually gone back to one token, which has reduced the ramp up and has allowed me to get much closer to full travel. That said, the travel now feels (as you’d expect) a lot more linear, with less overall support once you pass the sag point, and that’s noticeable on the faster and bigger stuff. In short, I miss the DVC. 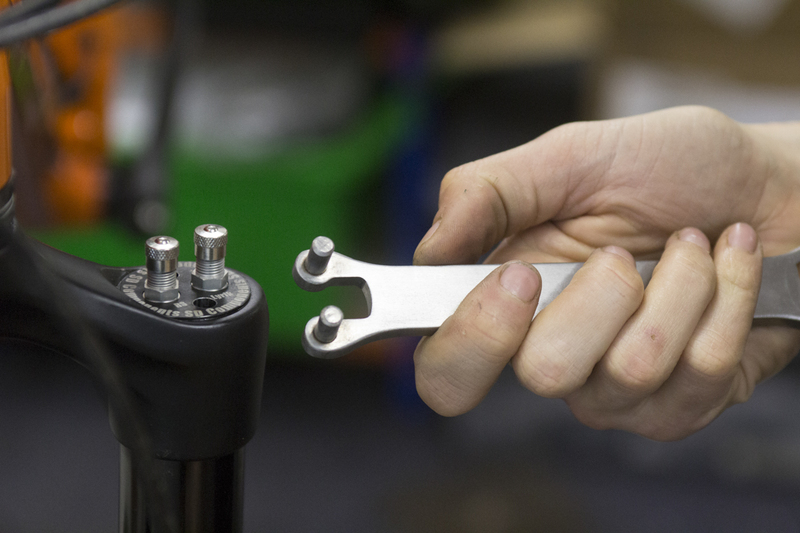 For this tester, the DVC offered extra tuneability of the fork’s spring behaviour. 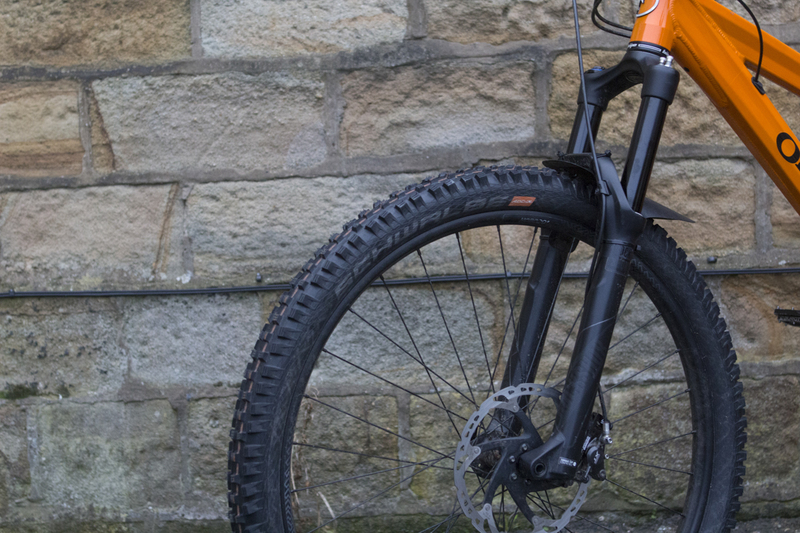 For achieving your ideal fork setup, the DVC offers more adjustability and more flexibility in the spring’s behaviour. In my case, using the DVC meant I was able to retain the small-bump sensitivity and mid-stroke support of my existing setup, but with greater control of the ending-stroke so I could access all of the travel. 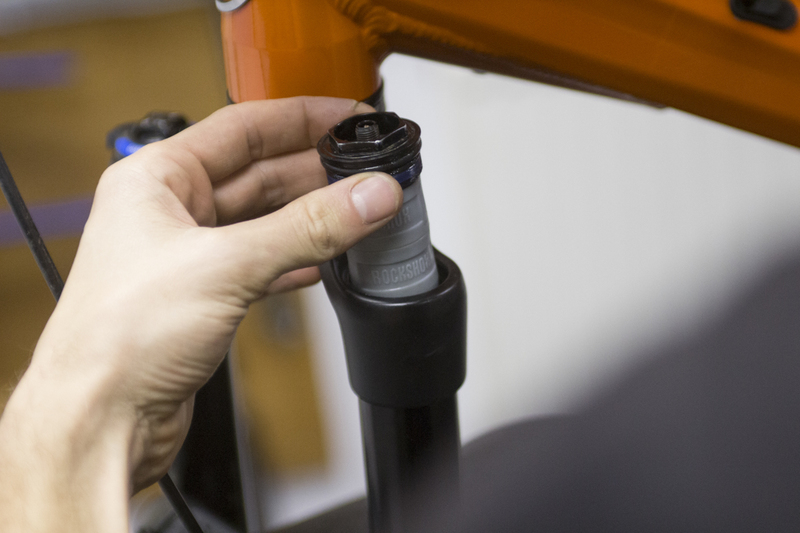 It isn’t a cheap upgrade, and you really need to know how to adjust your fork properly in the first place – if you don’t know what to look for, it’s potentially another wasted adjustment that can increase the complexity of setup. However, there’s no doubting this is a very well made piece of kit, and I experienced enough benefits from the added adjustability that I am now seriously considering buying one for myself. Can you saw a token in half and run 2.5 tokens? @bedfordrd – Absolutely! I’ve done that myself on a couple of occasions, where the difference between a whole token was just a little too much or too little. I don’t see how the warranty voiding panic is needed, it is very unlikely that this thing could damage the fork. And if your fork needed warranty service you wouldn’t send it back with this thing still installed.